We are officially in the last two months of the 2017 year and more than likely our homes will soon be graced with friends, family and yummy aromas of the Holiday season! During a gathering, it’s typical most people end up in the kitchen – whether it be talking to the chef, assisting with the turkey or grabbing an eggnog for “Cousin Eddie” (any Christmas Vacation fans out there?! ), the space will be at max capacity. 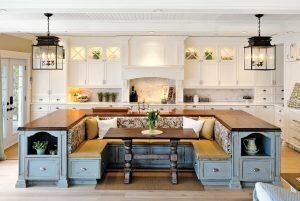 With the season approaching, we wanted to share one of our favorite kitchen trends – built-in seating! 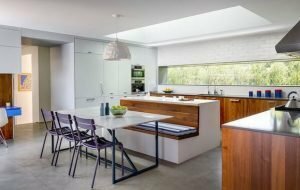 Imagine an island with countertop space, storage, cabinets AND built-in seating. Sounds comfortable, inviting and spacious, right?! Such a kitchen feature could potentially replace a kitchen nook or any kitchen dining. 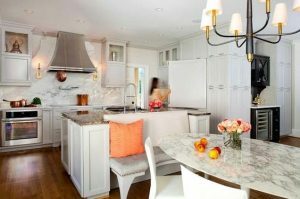 Check out for yourself below how some designers of all different styles have incorporated the approach to their client’s kitchens! I love how the shapes, styles, sizes and function can be customized to your kitchen and home needs! 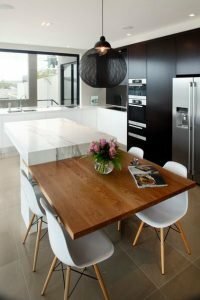 Whether it be seating for 8+ or a date night in, the built-in seating is an intimate and unique spin on traditional kitchen dining. If this transitional twist isn’t for you, take a look at some multi-level islands incorporating seating of different heights. Live ACo (f/k/a The Affordable Companies) displays a beautiful kitchen design with an oversize island and two heights of seating. What’s better than having plenty of kitchen workspace AND comfortable, inviting seating? Could your home benefit from built-in seating? 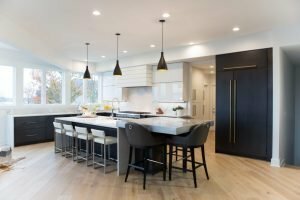 Be sure to visit the Live ACo (f/k/a The Affordable Companies) showroom or website and let one of their experienced designers help lead your kitchen remodel! Visit their website at http://liveACo.com or give them a call to schedule your appointment at 317.575.9540.